Evelyn is a pharmacist with an Msc. in Tropical and infectious Diseases who has over ten years experience at the Ministry of Health in Kenya. She has successfully championed the development of the National Policy and Action Plan for Antimicrobial Resistance in Kenya from a multi-sectoral perspective. She has been key in the implementation of infection prevention and control (IPC) interventions, antimicrobial resistance (AMR) surveillance activities, and antibiotic stewardship and awareness programs at a national level. As a member of the infection prevention and control team at the National Level within the Ministry of Health and she has supported the development and implementation of the National Infection Prevention and Control Guidelines and a national training curriculum for basic infection prevention and control for health care settings. Evelyn has organized antibiotic awareness weeks for five consecutive years in Kenya. This contributed to the establishment of the AMR program within the Ministry of Health. This year she will support the development of the National antimicrobial stewardship guidelines for Kenya. She has worked as a consultant with the World Health Organization on developing guidance on establishing and sustaining multi-sectoral collaboration to support implementation of the National Action Plans and was recently appointed as a member of the Fleming Fund Technical Advisory Group. 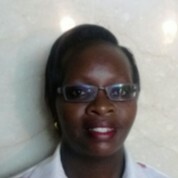 She is currently pursuing her PHD on antimicrobial stewardship at the University of Nairobi, School of Pharmacy. Evelyn is committed to overcoming barriers, work with partners within and from outside her country to sustain changes that will reduce the burden of AMR in Kenya.